A story all about them. Celebrate your loved ones' milestones with a meaningful, heartfelt and unique gift. A Feature is a magazine-style story that we write based on interviews with friends and family. Your Feature will be designed to look exactly like one you’d find in a high-quality magazine. We beautifully frame and package each Feature, so it's ready for gifting the moment it arrives. After purchasing, our easy online form lets you share your five sources (friends and family to be interviewed) with us. Then, you upload your photographs. Our professional writers interview your five sources. Depending on your package, those interviews may be over the phone or hosted digitally on our website. Interviews are the heart and soul of FeatureMe and what makes our product so unique and meaningful. Based on interviews with all five sources, your assigned writer will write a unique, heartfelt story. 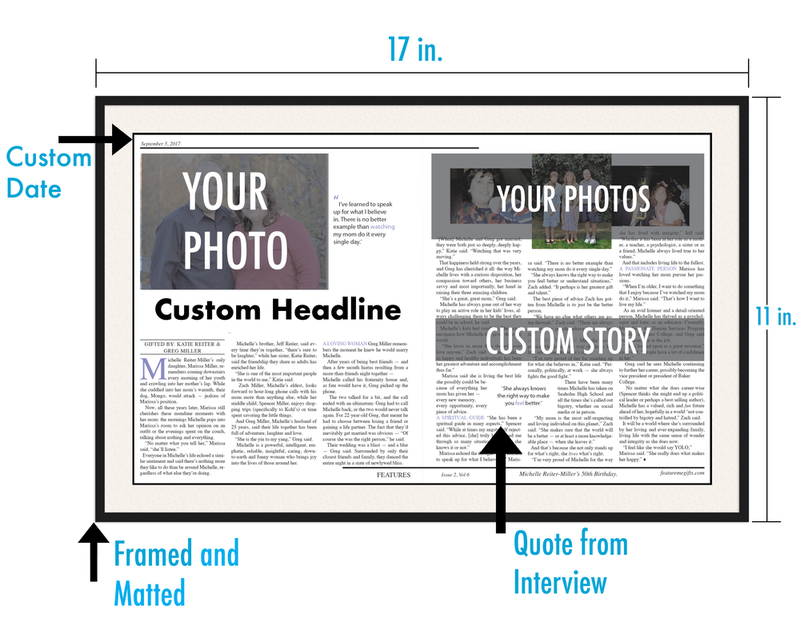 Then our designer will create a custom, magazine-style design for your Feature, before we print, frame and package it. Your Feature is ready for gifting the moment it arrives at your door. Weddings, Birthdays, Retirement, Graduation, New Babies, anything! Don't see the occasion you're looking for? Contact us, we can write about anything you want. You choose how many you need and what type(digital or phone). You can use the conservation quality framing which we provide or we will work with you to frame it any way that you want. To learn more and build your perfect Feature, contact us. "This is the best gift I have ever received." Features stand alone. You can't buy anything else that evokes so much emotion. Learn about how our interviews make each story truly special or contact us about our different packages.